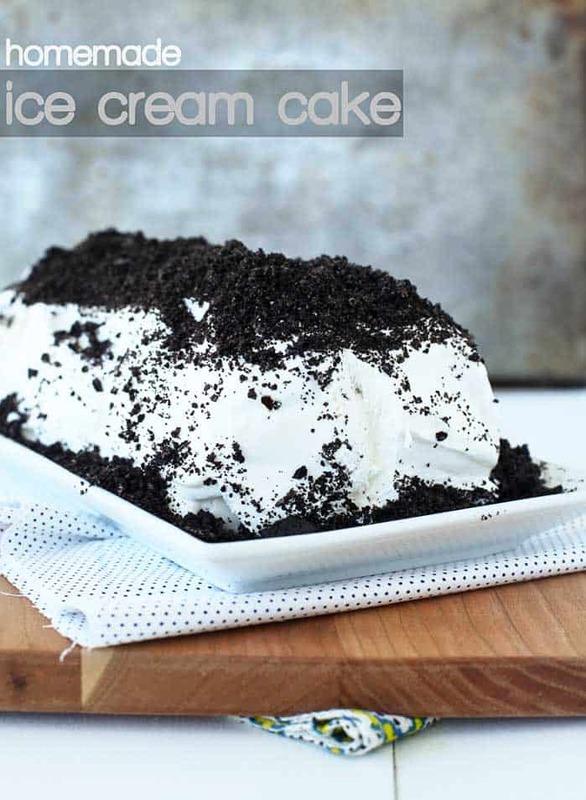 Homemade Ice Cream Cake– Wal Mart, vanilla ice cream, crushed cookies, hot fudge and whipped topping make this decadent dessert delicious and easy to make. Making your own ice cream cake is inexpensive, very easy and the end results are delicious! It’s so easy and delicious that you’ll be enjoying homemade ice cream cakes all summer long. While at Wal Mart recently I bought Blue Bunny ice cream and ice cream sandwiches to make this ice cream cake. I love making ice cream cakes and sharing them with friends and family. Everyone assumes it has to be time consuming to make. However, that’s not the case with this ice cream cake. The delicious layers come from the ice cream sandwiches. I add in some crushed chocolate sandwiches cookies and hot fudge sauce for some extra yum! I don’t know about you, but I can’t be trusted while there’s an ice cream cake in the freezer. I constantly want to open the door and take a small bite with a spoon until it reaches a point where I should have just dished some out in a bowl and ate it the “normal” way. What fun is that, though?!? What’s your favorite make at home treat using store bought ice cream? Be sure to follow Blue Bunny on Facebook and Pinterest and check the store demo list to see if a Wal Mart near you is doing Blue Bunny demos. Before adding the last layer of whipped topping, I scrape anything that has melted and dripped onto the pan, with a spoon. I then place that on top of the ice cream sandwiches and then add the whipped topping.